As we write, we are preparing our departure for a three-week trip to Turkey tomorrow morning. We will be attending two conferences there – a training seminar for missionary counselors that Diane will be attending, and a meeting of TEAM financial people from around the world which Mark will be attending. We will also spend 5 days visiting the historical sites of the country. We are looking forward to getting a break from the rigors of Chad. Before embarking on our journey, however, we want to send you some food for thought in the form of an essay we wrote exploring the roots of African poverty. On the lighter side, we have also included a photo journal of miscellaneous facets of our life and ministry. We hope you enjoy them. What no-one disputes is that Africa is always at the tail end of the world’s economic development. There is, however, little or no agreement as to why this is the case. The most popular explanation by far among young, smartly dressed Chadian Lycée students is that it is entirely the fault of the European colonists – never mind that it has been 53 years since independence, and that Asian economies with fewer resources and many more mouths to feed somehow managed to get ahead during the same period of history. Ask an “expert” in the West and they will almost certainly cite political mismanagement as the culprit. There is some merit to this point, but a perceptive observer will notice that the African political scene is frequently just the African village scene played out on a bigger stage with more money and guns. And the village scene is not going to change any time soon. But maybe there is another, deeper reason for Africa’s perennial difficulties. Let’s return to the village scene, and take another look. As we listen to the Voice of Chageen, an obituary is read out almost every day. In the rainy season there are frequently several every day. Every one of those obituaries represents maybe 50 people that sat on pins and needles for a week, in the case of typhoid, or for a terrifying 12 hours in the case of a viper bite, watching helplessly as their father, sister, or baby’s life ebbed away. Then consider that for every obituary we hear, there are maybe 20 other extended families, also of 50 people each, for whom the vigil ended in recovery, but for whom untold hours were spent anxiously wondering how they would pay for medicine, and whether they should make the two-day trip by ox-cart to the regional hospital, and if so, how they could possibly pay for the surgery or x-rays that such a trip might entail. The cumulative effect of such relentless, pervasive stress on a society is not hard to imagine. Sickness and death are, of course, the extreme. But normal life is not much better. The agricultural labor the Kwong engage in is punishing. Our own experience of spending even an hour in the blazing African sun reflecting off a thousand square miles of flooded plains, tilling a field with a short handled hoe in a foot of snake infested water was more than enough for us. But they do it, or some variation of it depending on the season, almost every day for 9 months of the year. And notwithstanding their efforts, they still spend a significant part of each year hungrier than anyone on welfare in the USA could even imagine. If Providence smiles upon them, they will not be disabled by a thorn in their bare feet, their oxen will not get sick, there will be enough water on their fields, the birds won’t eat the ripening grain, the nomads’ herds won’t devastate the fields, and thieves won’t make off with the harvest. All this time, they are wondering, hoping, and worrying like any of us would - never mind the sick child at home whose story we have already heard. In a word, they live very hard lives. Now imagine your own life. We all know the experience of too many stressful things happening at once – tensions in the workplace, teenage kids getting into trouble, expensive car repairs, a letter from the IRS, or marital issues. What happens? You start to shut down, cut your losses, and circle the wagons. You “focus.” Creativity, initiative, and anything else that isn’t strictly necessary goes out the window. And above all, you don’t take unnecessary risks. You go into survival mode, and that’s how you pull through. You get the picture. Large parts of Africa consist of communities which are perpetually in just this kind of numbing survival mode which we have all experienced to some degree in our lives. No creativity, no initiative, no risk taking. They just make sure that they have enough food to get by until next year, and enough emotional reserve to handle the inevitable crises of health and death. And by all appearances, they have been doing this for a hundred generations. And that does make you wonder: What ever happened to the would-be Ciceros, Galileos, and Gutenburgs lost in the shadows of Kwong history? Could they survive? Did they survive? Or did some kind of perverse Darwinian selection wipe these mavericks out? We will never know. But this much is clear: it is not for nothing that the Africans struggle today. They live very hard lives, and they have done so for a very long time. The Gospel insists that those of us for whom the boundary lines have fallen in more pleasant places help these for whom a more bitter Providence was in store. It only remains to discern how best to do so. May God grant us that grace. “Cool” is the universal language of 13 year-old boys, whether in the USA or in Kwongland. In the USA, it is defined by a name-brand piece of clothing. 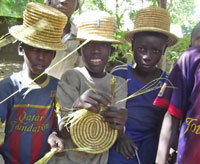 Here it is defined by the grass hat you weave. We doubt the Nike boys back home would be impressed. Every once in a while an exceptional young person comes along with whom we really want to invest quality time. François’ daughter Ruth is one such bright light in the firmament of Kwong children. Diane only wishes she could spend more time with her. Oh for a young couple to work with the kids full-time! Mark and Jonas continue their Albert and Costello routine of teaching the children, and indeed the whole of the Kwong tribe via the resulting radio broadcasts, the history of Israel. After more than 130 episodes, they are finally telling the stories of the exile of Judah to Babylon in 586 BC. 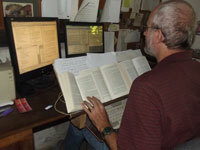 Mark and the guys have been diligently translating the book of Psalms for the last couple months. Mark has been impressed by the way in which understanding the back-ground of each Psalm does so much to throw the words of the Psalm itself into sharp relief. He has put considerable effort into writing introductions which he hopes will imbue the Kwong with the same appreciation. The NRA may want to consider starting a chapter here in Chageen. Can’t say we’re interested in joining ourselves, but we’re pretty sure our neighbor Toode will sign up in a hurry – if someone writes his name for him, that is. Toode’s assault rifle is made from genuine Chageen clay and straw. 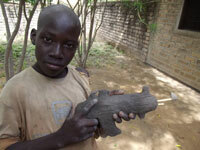 Weapons of any kind of the more lethal variety are strictly illegal in Chad. Our favorite time of year is rainy season. Not only does the brown wasteland of Chad turn into a veritable Eden, but Diane’s garden springs to life, thanks in no small measure to the generous quantities of pond-bottom soil, compost, ash, and manure we put on it each year. 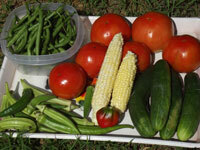 This year’s harvest was exceptionally bountiful and delicious. Our colleagues Jack and Nancy (left) Snyder run Team’s print shop in Chad. 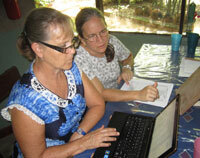 They have been printing our Kwong discipleship books, Scripture, and literacy materials for 20 years. We were recently able to repay in a small way their service to us by hosting them in Chageen to help them set up new accounting software and procedures which will help them run the shop more efficiently. Send mail to The_Vanderkoois@yahoo.com with questions or comments about this web site.